Smart Kids: Third Grade is a one-stop-app for a third grader to learn Math, English, Science and Social. The app is designed in a kid-friendly manner with easy to navigate screens. Help students develop the skills they need to succeed on STAR(Standardized Testing and Reporting) test. *All states curriculum is taken in to consideration. *Maintained high standards and framed good quality questions in all subjects. *Some questions follow True or False pattern to explain the concepts. *Explanations are provided for some hard questions to guide the kid in learning the concepts. *Performance card is provided to keep track of each subject score. It helps parents to easily analyze which subjects the kid excels and subjects that have scope to improve. -Additions(Easy number additions to Hard word problems). -Subtractions(Easy number subtractions to Hard word problems). -Geometry(Number of sides and vertices from Triangle to Decagon, Perimeter). -Fractions(fractions to understand the concepts). -Time(Reading different clocks, Hours and minutes concepts). -General(Concepts Even numbers, Odd numbers and Number patterns). -Grammar(Punctuations, Compound words, Nouns, Verbs, Adverbs and Adjectives). -Sentence(Fill in the blanks, Complete sentences). -Spelling(Identify the correct spelled word, word meanings). -Life science (Basic understanding of Plants and Animals). -Earth Science (Measuring concepts like Pounds, Fahrenheit, Miles and Gallons). -Physical Science(Concepts for material states like Solids, Liquids and Gases). -Geography(States, Capitals, State Nicknames, and Outline Maps). -Civics (Basic functionality of Government branches Legislative, Judicial and Executive). -History(American History and Historic Places). -General(Time Zones like EST, CST and PST). More content will be added on a regular basis so please check for updates. Practicing more number of times will give enough information for a Third grader. Some questions may look high standards for a Third grader but we have taken different U.S. states curriculum into consideration while preparing them. 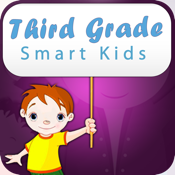 We value your feedback, so please email us at info@smartkidsway.com for suggestions on improving our Third Grade App. We respect and value your privacy at Suma Solutions, Inc. We do not collect personally identifiable information and we do not have links to external sites, social media, ads or in-app purchases within this app.